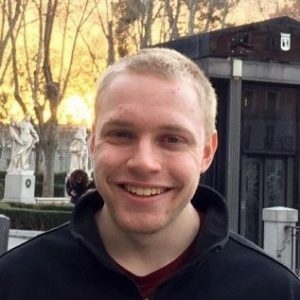 Joseph Weissman graduated from Virginia Tech in May 2018 with triple majors — mathematics, physics, and Computational Modeling and Data Analytics (CMDA). His final project for the class evolved into the research project he is now working on as a master’s student at the Discovery Analytics Center, where he is advised by Srijan Sengupta. Since this method works for practically any network, he said, there are many applications. “One example we have been playing with is finding the core members of a social group,” Weisman said. Last week at the Scientific Machine Learning conference at Brown University in Providence, Rhode Island, Weissman presented the work he has done Sengupta, “Core-Periphery Inference,” during a poster session for graduate students. During the fall semester, Weissman was also busy helping Mark Embree, DAC faculty and professor of mathematics, design data science classes for the Virginia Tech Honors College Calhoun Discovery Program. “I love working on challenging research projects with real world applications,” said Weissman, who held two internships last summer. As a data analyst intern for Capital One, he helped migrate data products to Amazon Web Services and, as a data analyst intern for a defense company, he worked on helping to solve deep learning problems. Weissman expects to earn a master’s degree in mathematics in Spring 2019. Currently, he said, he is leaning toward working for a year before pursuing a Ph.D. in statistics.